OMD Custom Embroidery, How to Order? Customers often ask, "how do I place my order?" and "what is the process & policy?" This page will answer those questions for you. First and foremost is your satsifaction is our goal. We do everything within our power to make sure you are 100% pleased with your order with us. However keep in mind that once your items are embroidered, they can not be returned or refunded. So we need you to be sure to confirm all the information, make sure your sizes are correct and make sure the proof is exactly what you want before you approve and before we send your order to production. 1. Purchase blank samples for sizing and for seeing/feeling the garment. The price we charge for blank samples is our 6 piece pricing and they are not refundable. Should you place an order with us, send those samples back and we will include them in your order and embroider them for free. We drop ship blank samples from our distributor so you have it within a few days. 2. The option to buy just 1 piece to test our work/quality, shirt & size. You would pay the 1 piece pricing + set up fee+ shipping. Turnaround time can be a bit longer for individual items. 3. We offer to assist you in getting additional information on our items before you order to be sure your item is what you want. Be sure to take advantage of our services to guarentee your order is perfect! Email sales for more information. The best way to place your order is by filling our our ONLINE SECURE FORM. Yes, it's a very simple form. We have delibertately kept our website simple to keep our costs down so we can offer our customers better savings. If you have your order written in an .doc or worksheet, you can upload it easily. You will be asked to upload your logo on that form as well. If you don't have a logo, click here to view some stock designs to choose from or a specific text. Be sure to be specific in what you would like, thread color, text style etc. If you would rather call us with your order, that is fine too. Our toll free number is: (800) 485-1766. Ask for Denise. If you selected on the form that you want a cost summary before processing, you will receive that within 24-48 hours. Or you can select the option to bipass that step if you are in a hurry or wish to just proceed without receiving a cost summary. For those receiving an order confirmation, this should arrive within 24-48 hours. Your timely response is important so as not to delay your order. IMPORTANT: Please be sure to look it over your invoice carefully to be sure we have everything correct, including shipping/billing and product type, sizes color etc. Should you approve an incorrect invoice, OMD can not be held responsible. If placing your order over the phone, we will send you an invoice confirmation which will require your approval to process. We want to be sure everything is correct, including product, color, shipping etc. You will need to email us your logo to complete the order process. Please send in a high rez 300 dpi .jpg format if possible. If that is not possible, we will work with your graphic as best we can. NOTE: Once your order has been confirmed and processed, it can not be changed. The garments are ordered immediately as we prepare your logo by turning it into a stitches design. Should you decide to cancel your order, you will be charged a 25% restocking fee. We send you an email proof of your embroidered logo for approval within 3-4 business days of order approval. (unless you specify on the form, to bipass this step) Your card is billed once you have approved the proof and your order is scheduled for production. And again, prompt turnaround depends a great deal on how quickly you get back to us on changes & approval of the artwork. Once your items have been embroidered, there are no refunds, exchanges or returns. Once your logo is approved, we schedule your order for production. This can be anywhere between 4-10 days after logo approval. Email us for current turnaround times. This does vary depending on the season. Your order is embroidered, ironed & folded for packaging. Here at OMD we don't use fancy packaging or boxes. This is just another way to keep our costs down and offer our customers the best savings. But rest assured that your order has been given top notch attention and extreme care to detail and quality outcome. So we hope you are happy with our services, quality AND savings here at OMD! When your order is complete and ready to ship, we email you with UPS tracking number & your paid invoice. See the map below to get an idea of how long it will take to receive your package. Keep in mind this is just an estimate and it might be best to add another day. Ground shipping is not guaranteed. We always appreciate hearing from our customers after they receive their product from us. It is our way of knowing if we are doing our job and ways we can improve. Once you receive your order, please fill out our customer feedback form and as a thank you from us, receive free shipping on your next order! To place a reorder using the same " bill to" information as before, you can simply email us and we can finalize your details that way. If using a new credit card, it's best to either call or fill out the online form again as email is not secure. If you need help on product styles you have ordered before or would like to reconfirm the proof we sent to you for your previous order, we can do that too. Feel free at anytime to email us with questions or concerns. We are happy to assist you! Or call toll free at (800) 485-1766. Thank you for choosing OMD Embroidery & Imprinting! We stock an array of thread colors. However, you are looking for a particular color, here is a thread color chart showing the Isacord Thread we use. We don't carry every color shown here, but we can try to match it up closely to what you would like OR we can order in custom thread for you. Cost per color for custom thread would be: $30 each. Click here for thread color chart. THREE Choices for choosing your embroidery. 1. Email us your logo in a eps, pdf, .jpg, .bmp, .gif format. High resolution, 300 dpi preferred. 2. Choose a stock design from one of our EMBROIDERY STOCK DESIGNS Catalogs. We work with Dakota Collectibles because they have the biggest selection and their design prices are very low. Click the icon below to visit their website. The cost of each design is listed in a (25) para thesis, which means it is $25.00. Let us know which stock number it is and we can order if for you. These formats can only be read with embroidery digitizing software, so they are for embroidery purposes only. 3. 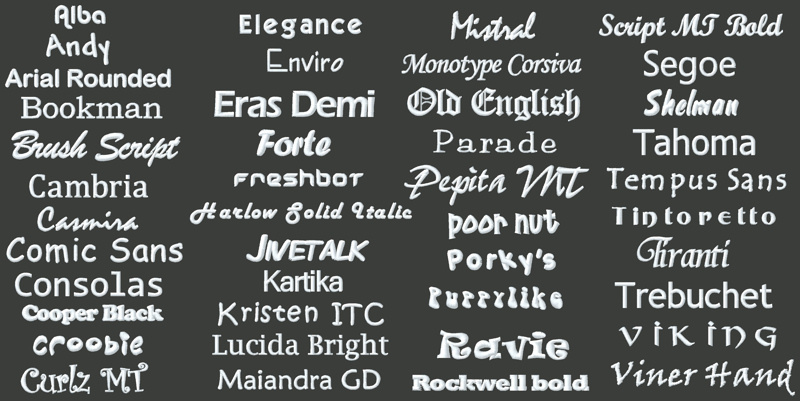 Text only: If you choose to just go with a simple text for your embroidery, choose from one of the font styles below. If you don't see one you like, email us. We have many others but these are among our customer's favorites and embroider very well. If you have a .ttf that is specific to your logo, you can email that to us and we can generate any font you wish....for FREE!